Prepare Grits according to package prior to cooking the shrimp mixture. Keep warm on stove top. Brown sausage – crumbling but not too much (big pieces are great). Once cooked through, remove with a slotted spoon on to a paper towel to drain. Saute shrimp in same pan (with the leftover grease from sausage) – for 2-3 minutes until pink. Add 1 pint of Vodka Sauce. 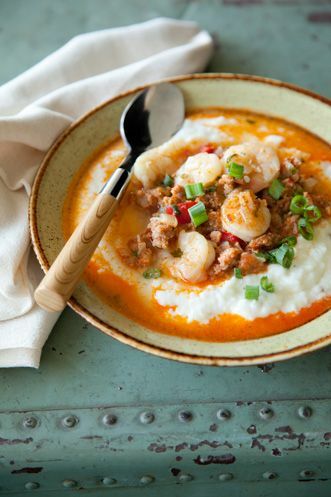 Once it starts to bubble, serve immediately over grits. Garnish with a sprinkle of parmesan cheese.